Our editors love a great throwback piece, especially if it's giving us major '90s vibes—one of our favorite decades to look at for style inspiration at the moment. This season the return of the velour turtleneck has got our attention and for good reason. The textured top makes a great addition to any winter wardrobe whether for work or play. It's also not only perfect for layering into everyday looks, it's a great piece to incorporate into a holiday outfit as well. Needless to say, we love an effortless top to mix and match. Funny enough the styling is not that much different than it was back in the '90s. For a more casual ensemble, layer a velour turtleneck under a checked blazer, then complete the look with high-waisted jeans like Levi's Wedgie Icon Jeans (we told you we love the decade), and stylish loafers. As for a dressier take that can carry you from the office to date night, try wearing the top with a pair of leather culotte-style pants and elevated mule heels. 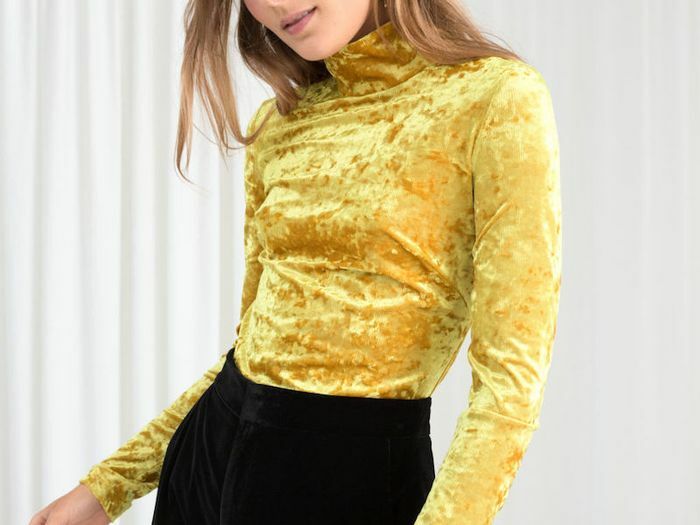 For any upcoming holiday festivities, the velour turtleneck would look amazing with a statement skirt and thick tights that add warmth along with a pair of sleek ankle boots. Either way, the piece is so versatile, it's hard to wrong no matter the combination. Keep scrolling to shop our roundup of the coolest velour turtlenecks of season. Whether it's classic black or a fashion-forward bright pick, we're sure you'll find an option you'll love to wear all season long. 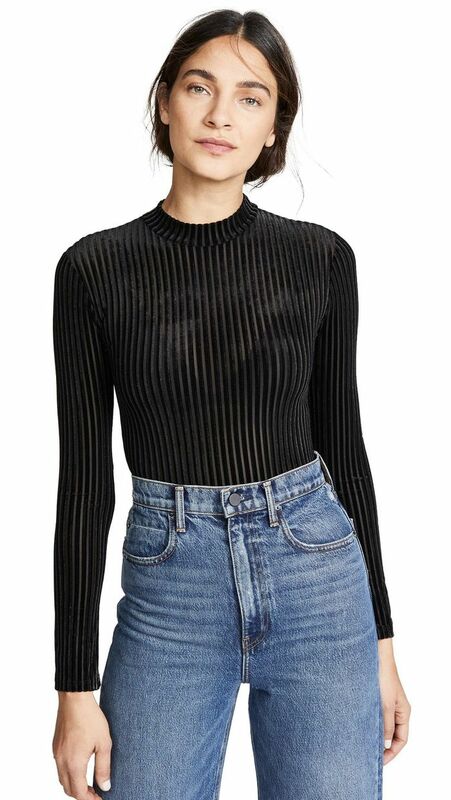 A ribbed version in black is a great alternative to your usual night-out top. Our editors have been obsessed with this yellow pick ever since we laid our eyes on it. Say hello to your new uniform. So chic! This vibrant short-sleeve option is great for dressing up. Here's an example of dark fall florals done right. This luxe-looking top is great for elevating your workout outfit. This classic option is giving us major '90s vibes. A pale pink goes great with everything from your favorite jeans to a pretty skirt. This jewel tone would do wonders in your holiday wardrobe. This vibrant striped top is not for the faint of heart. This fashion-forward collaboration was highly celebrated among the fashion crowd. This turtleneck is making us feel nostalgic—it looks just like some of the ones we wore growing up. A sleek black velour top is always a good choice. We can't get enough of the illusion of a bustier from this turtleneck. The neck cut-out gives this option and updated feel. The olive-brown tone of this stylish option is spot-on for fall and winter. The styling possibilities are endless with this black turtleneck. Go sporty-chic with this bright orange draw-string design. This investment piece will be worn for many seasons to come. For a more casual feel, try this slouchy fit. A bodysuit keeps this piece taught and in place whether you pair it with jeans, pants or a cool skirt. Want to add another great turtleneck option into your repertoire? Check out these stylish turtlenecks.